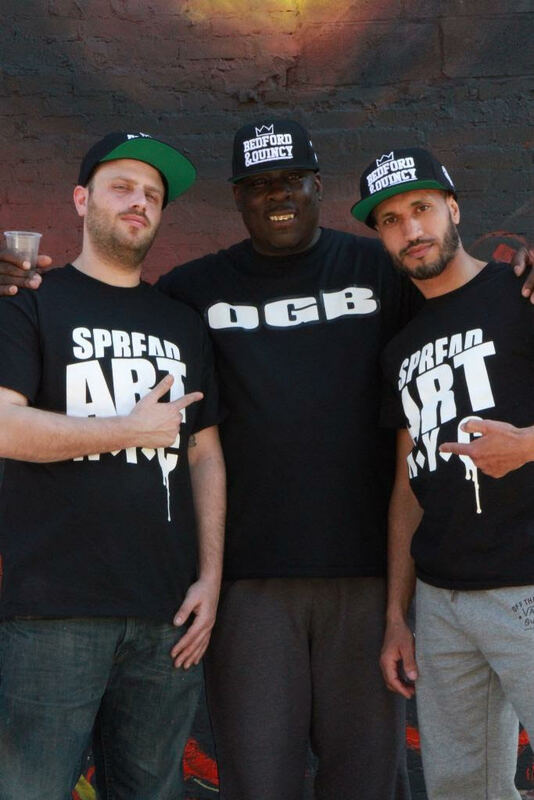 This past Sunday, I had the opportunity to meet up with Rocko, artist and founder of Spread Art NYC. We discussed the Biggie KONY mural that he’d painted with Zimer, the wide attention it has recently attracted and his efforts to preserve it. When was the mural first painted? And how did you decide on its subject? Zimer and I painted it back in 2015. As it was our first mural in Bed-Stuy, we decided that it must be of Biggie. What about the specific site — on Quincy and Bedford? How did that come to be? I researched Biggie and the neighborhood for about a year. 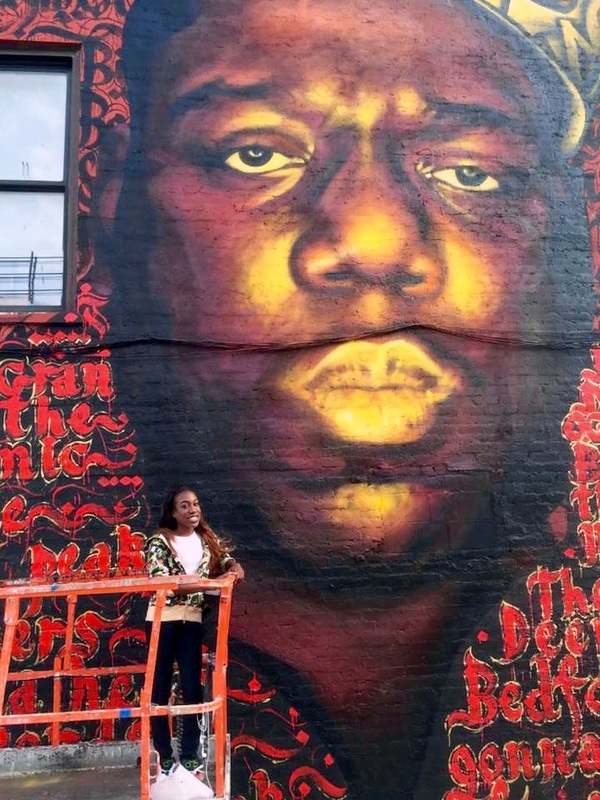 I picked this site for the mural because Biggie had referenced it in his first demo tape “Microphone Murderer.” I’d also found a video of Biggie freestyling at the age 17 on Bedford and Quincy. I located the site and was put in touch with the building’s owner, who agreed to let us paint a mural. We signed the agreement five minutes after we’d met! I was impressed by the landlord’s kindness and generosity. What was the initial response to the mural? Incredible! It was all over the news. 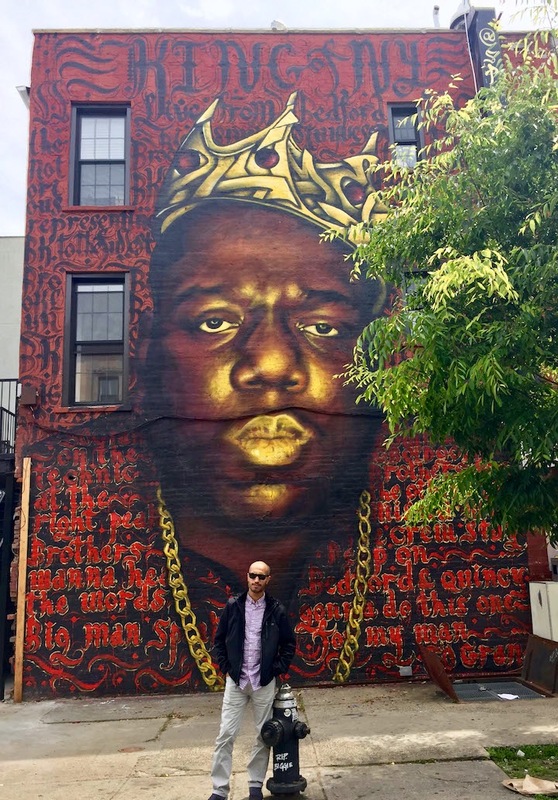 And in 2016, when Borough President Eric Adams recognized Biggie’s birthday, May 21, as Official Biggie Day, it received even more attention. When did you find out about plans to remove it? About four months ago, the landlord told me that he wished to renovate the property and add windows to it. I asked him to see if it was possible to do so without damaging the mural. He agreed to speak to the architect. But soon after, he asked us to pay $1250 a month to maintain it. He told me that advertisers are renting other walls he owns for at least $1250 a month. And that if he didn’t add windows, he would have to charge me the $1250 he would otherwise get. How did you respond to that request? I offered a one-time payment of $5000, but he said he had paid more than that in construction costs and permits, and that our mural is causing him to lose money. At that point, I couldn’t argue with him. I knew that he was telling me the truth. What spurred you to post about the situation on Instagram? 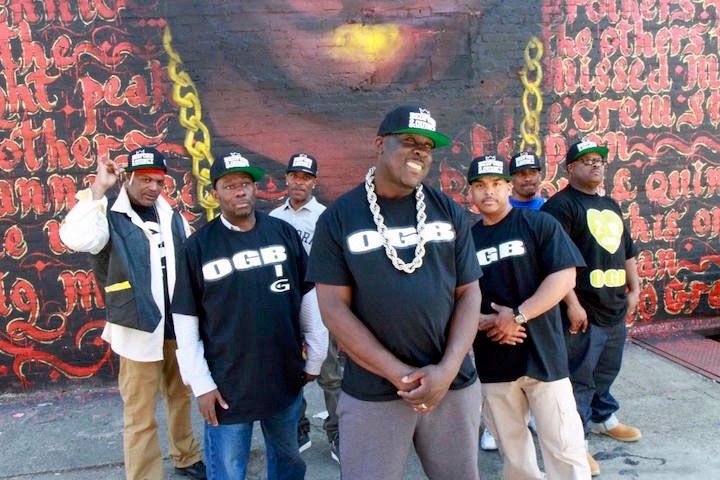 There are so many people – from DJ 50 Grand to Matty C to the OGB crew — deeply connected to this mural and all that it represents. We felt that we had to go public with the sad news that our beloved Biggie mural might be put to rest soon. When did you find out that what you’d put out was going viral? The next day, I woke up to a load of emails from local news sources wanting to get more info. Zimer and I declined to comment until we knew what was really going on. Among the many efforts from community members and organizations was a landmark petition. That was problematic to you. Why? I don’t have any issue with the people who started the petition. They genuinely care about their community and culture. But I didn’t want to go the way of a petition. Look at what happened to 5Pointz! On November 19, 2013, the landlord whitewashed the building overnight. I think we all have learned from that tragedy. And we didn’t want that to happen to the KONY Biggie mural. How did the landlord react to the petition? The landlord refused to even meet with me because he thought I was the one who’d started the landmark petition. He told me that he would do what it takes to protect his property. At this point, I knew we were at the edge of losing. Why do you suppose the landlord had taken such a strong stand? He is well-known and well-respected in his community, and was most likely upset that he was being portrayed in a negative light. What was your next move in your determination to save the mural ? I had to convince the landlord that I had nothing to do with the petition. 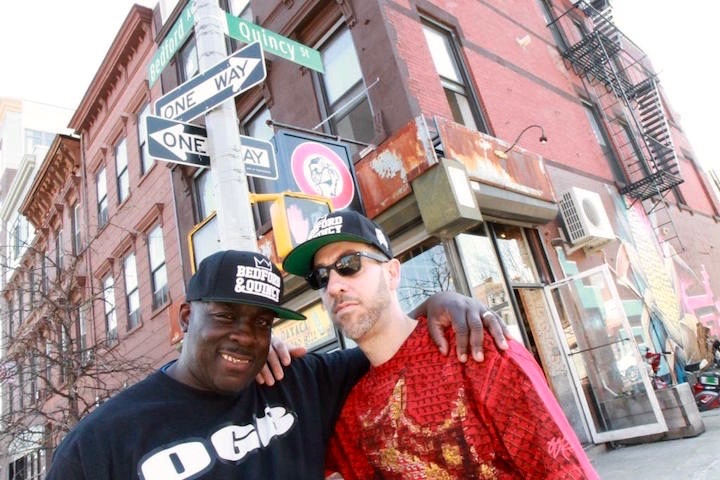 We were planning to have a huge Block party on Biggie’s birthday, but we had to cancel. There was too much confusion and misunderstanding. What — do you think — caused him to change his mind and decide to let the mural remain? During a two-hour meeting last Monday, it became obvious to me that he was not aware who Biggie was or of Biggie’s connection to Bedford and Quincy. I informed him that the Brooklyn Nets, Atlanta rapper TI, and various Mega companies were willing to pay whatever to save the mural, and that the Mayor and Congressman Jeffries are also offering support. Once he understood the significance of the mural, he agreed to keep it. I had also made the point that other landlords were paying thousands of dollars to artists they hire to paint their building’s facades – and that it did not make any sense to remove artwork that was “gifted” to him and the community. What a happy ending! So the landlord did not ask for any money?